State Bank of India (SBI) had invited ONLINE Applications through the notification provided on the official website and successfully completed the process of filling ONLINE applications for the post of 6425 CLERK in for the various Associate Banks i.e. State Bank of Mysore, State Bank of Patiala, State Bank of Travancore, State Bank of Bikaner and Jaipur and State Bank of Hydrabad. · Final Date of Exam will be discussed later on the same post. So keep visiting regularly to get updated for the exam. The list of Bank wise vacancies is discussed in the Advertisement of SBI Clerk for the Associate Banks. The list contains the vacancies of each bank along with Reserved and Unreserved Categories i.e. unreserved category-UR/General and reserved Category-OBC/SC/ST. Follow the same steps which are discussed above in How to download Admit Cards Call Letters to download Hall Tickets for SBI clerk Exam for Associate Banks. · Computer Generated Admit Card, Original ID and Photocopy of original ID will be checked twice by the Bank Personnel/Officers. The SBI Clerk Admit Cards will be conducted ONLINE MODE. 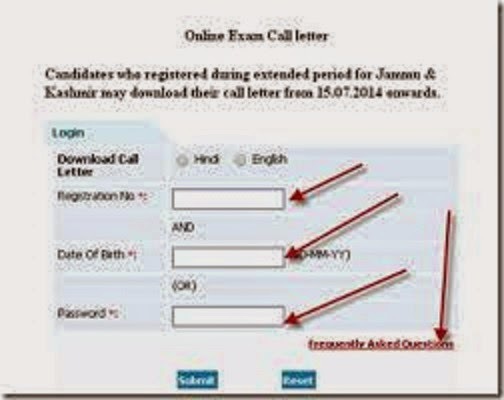 The exam will be entertained through ONLINE filling of circles on Computer Generated Page containing information of questions and answers will be selected by clicking on the circle in it. There is no need of OMR sheet to be filled by Blue/Black ball point pen. The exam consists of four sections English, Reasoning, Quantitative Aptitude, General Awareness and Computer Intelligence. The exam will be a multiple choice question paper of total 200 questions for 200 marks and five options are provided out of which candidates need to choose one correct answer. Each section will of 40 marks in which 40 questions will be provided for ONLINE answers. There will be a negative marking of 0.25 per wrong answer. For more information candidate must download syllabus and exam pattern of SBI Clerk. Exam will be conducted on the scheduled time mentioned in SBI CLERK Admit cards of the candidates. The Official Answer keys will not be discussed on the official website of SBI. The unofficial answer keys which will be solved by various institutes will be published within 4-5 hours after the test. These answer keys will be prepared by the experience of SBI Clerk exam which will be shared by the candidates on memory based. Candidate can match their answer with the answer keys which will be provided on this website after SBI Clerk Exam. Candidate can download questions asked in SBI Clerk Exam 2015 from here also.